IDF military intelligence chief warns Iran working to take over large swathes of the Middle East. 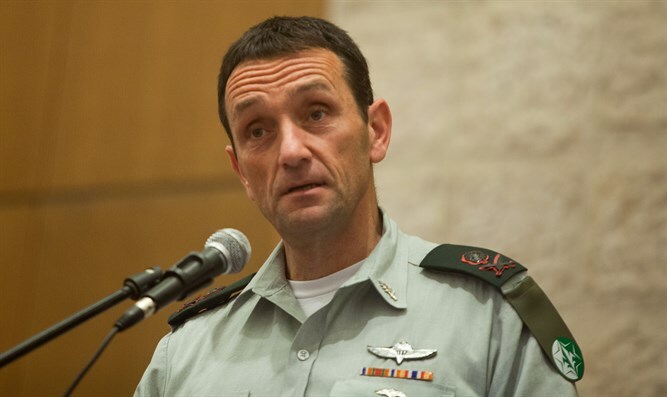 Major-General Herzi Halevy, the head of IDF military intelligence, accused Iran of attempting to carve up the Middle East. Maj.-Gen. Halevy addressed the Iranian source of the recent escalation in tensions on Israel's northern border with Syria and Lebanon at the Yediot Aharonot conference Sunday. "Israel maintains a very high capability on the northern front, but Israel has no offensive intentions against the Lebanese state," Halevy said. Last month, an Iranian drone penetrated Israeli airspace from Syria, touching off clashes between Israel and the Syrian regime. "Iran is firing a 'Shi'ite arrow' that is carving up the Middle East, so harnessing our powers is not only an Israeli interest, but of the entire Middle East," he said. The head of Military Intelligence also referred to Israel's intelligence capabilities in light of the threats. "In the age of information and knowledge, those who obtain more information will win, and in real-time. Fortunately, the IDF is very strong in these areas."